(Downers Grove, IL: InterVarsity Press, 1998). Not all people of different cultures and religious beliefs live halfway around the globe. Some of them live halfway down the block. Encounters with these neighboring faiths, whether in the guise of fellow students at school or college or coworkers at the office, challenge our familiar worlds and make us think more about our own faith. 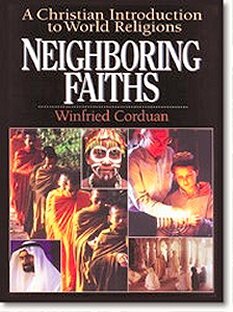 In this book, I attempt to offer a helpful introduction to major religions of the world. Unlike many other textbooks, I try to emphasize not just formal religious teachings but how each religion is practiced in daily life. Moving beyond mere descriptions, I give specific suggestions for how Christians can avoid giving unnecessary offense to adherents of these faiths while learning to engage them in constructive dialogue. The result is a book that should prove useful not just to students but to all Christians who would like to understand other world religions better. David K. Clark writes: "Some Christians declare their faith before understanding another person's religion. To avoid this blunder, others never let on about their faith. Win Corduan will lead readers first to genuine comprehension and then to competent sharing. In an era dominated by easy pluralism, this book gets it just right."